The Platform Sutra is perhaps the most famous teaching from the Sixth Patriach, Hui Neng (638-713). The Platform Sutra is also known as the Sutra of Wei Lang, from the first translation into English published in 1930 by Mr. Wong Mou-lam. 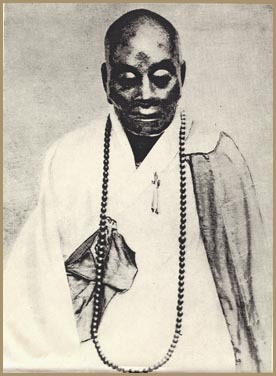 This is the only writing from a Zen master to have been given the status of "Sutra", a term otherwise reserved for teachings from the Buddha as recounted by Ananda. Page numbers appearing on the top of each page correspond to the pages in Thomas Cleary's translation, The Sutra of Hui-Neng Grand master of Zen. This provides easy cross-reference to a popular translation of the work. To print a page, click on the "print page" link, then print that page from the browser. Hui Neng's mummy. This photo was taken before the Cultural Revolution and the Red Guard's damage to the remains in the 1960's. The mummy had to be reassembled and lacquered heavily after the damage.